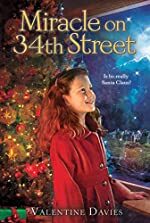 Review: Classical, well written, and a heart-warming story all describe Miracle on 34th Street. Valentine Davies out does himself with this fantastic novel. This book is as successful as it was in 1947, when it was first released. It is a Christmas classic, and it will be in that genre forever. Susan is a realistic girl who believes in no fairy tales or myths of any kind. She has no imagination to help her escape the real world. Doris Walker, Susan's mother, has the same beliefs. However, Fred Gayley is the exact opposite. Mr. Kris Kringle believes he is Santa Claus and agrees with Mr. Gayley. How will their world collide? We start our story at the Macy's Thanksgiving Day Parade. Mrs. Walker is trying to direct the parade when she finds out that her Santa Claus is intoxicated. When Kris Kringle reports to Mrs. Walker that her Santa Claus is not fit to be in the parade, she needs a last minute replacement for this imposter. Kris Kringle looks exactly like Santa because he is Santa! People think that he is mental because he believes that he Santa Claus. He spreads noncommercial Christmas spirit all over New York City. The whole city is in a state of shock by Macy's Christmas spirit. As the story progresses, Kris wins over the beliefs of Susan and Doris. The matter of Kris Kringle being Santa Claus goes to the courtroom after Mr. Sawyer becomes involved in the matter. Fred Gayley is in defense of Mr.Kringle. This crazy court ends in a happy way for all. Bit is he really Santa Claus? I love the movie and anyone who does will have the same love for the book. This is a touching story about a little girl who has people teach her to believe. When many kids grow older, they do not believe in Santa. It is almost the same with Susan, except she is much younger. She is a skeptical child who does not believe in fairytales or magic. We can relate to the feeling when we get up on Christmas to find presents under the tree. Susan feels that for the first time in this book, getting the present she always had dreamed of for so long. The story teaches you a lesson too. "Faith is believing in things when common sense tells you not to." You need to love and have faith in people. Common sense and reality are not the only things in life. You need to imagine and think the unthinkable. Miracle on 34th Street moves through each scene nicely. Every detail ties to the plot and is wrapped in like a Christmas present. The characters develop through the story and you cannot help but fall in love with them. The ending to this story is not at all disappointing. I loved the way that they leave you wanting more. This book belongs in a five star book show. We would like to thank Houghton Mifflin Harcourt for providing a copy of Miracle on 34th Street for this review. Have you read Miracle on 34th Street? How would you rate it? It is a very interesting story showing how the innocence of imagination is reignited. There a lot of things we think that are impossible, but they turn out to be possible. There is another children's story that illustrates this: The Thanksgiving Coat: Illustrated by Kailee. It shows how a poor family is relieved by the efforts of a more well-off family. Care can sometimes seem as impossible as imagination.